Mixing and Thinning: Shake or mix thoroughly and stir continuously while using. Thin when necessary with Reducer–974. Theoretical Coverage: Depending on surface conditions, one gallon of bottom paint will usually cover over 400 square feet of surface when brushed or rolled. Clean Up: Use Reducer–974 for cleaning equipment and paint brushes. 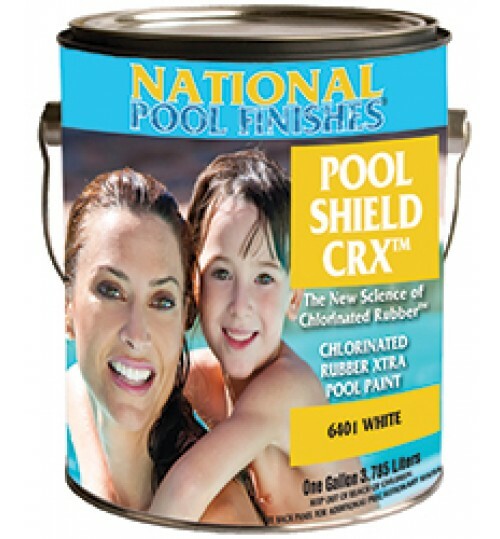 Estimated Dry Times: Bottom paints are designed for overcoating after an overnight dry. Prior to launching, allow a minimum dry of overnight. 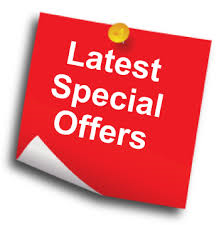 If drying conditions are poor, or if paint was applied too thickly, longer periods of drying will be required. Fresh coats of paint must be thoroughly dry before overcoating. Surface Preparation: Surface must always be clean, dry and properly prepared prior to painting. Failure to do so will lead to eventually blistering and/or peeling. All sanded surfaces must be wiped clean with Dewaxer-973 to remove sanding residue. General Application: For use on boats below the true waterline. Can be brushed or rolled on fiberglass, wood, steel and previously painted surfaces per application systems below. Do not use on aluminum. Apply at least 2 coats for best performance, as the life of the paint is proportional to the number of coats applied. Yearly Repainting: Scrub bottom clean at haul-out. Repaint only if old paint is sound and tight; if not, remove it by sanding or with paint remover. If old paint is rough, sand it with 100-150 grit sandpaper. Prepare seams, nicks and chips as below. Spotcoat any scuffs with antifoulant. Apply 2 coats of antifoulant. On Bare Wood: If seams are not flush, fill them with seam compound. Dry several days until skin forms. Do not sand. Fill nicks with trowel cement, dry hard, sand, apply antifoulant (reduced 10%) then follow with 2 additional unreduced coats of antifoulant. 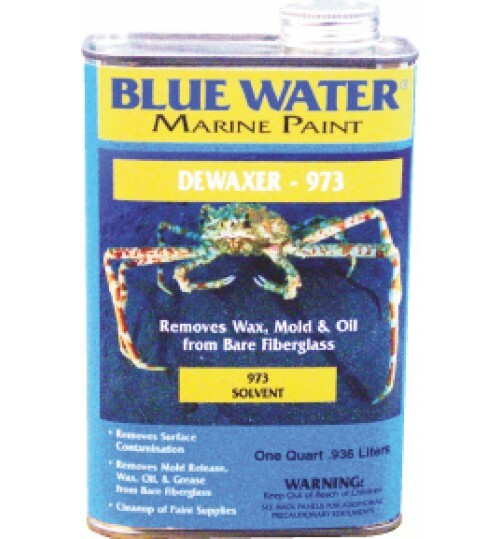 On Bare Fiberglass: Dewax by washing with Dewaxer-973, remove dissolved wax at once with clean paper towels or rags; repeat; sand hard to a dull finish with 80-100 grit sandpaper. Fill any chips with trowel cement, dry hard, sand. Apply 3-5 coats of 8000A/8000B Bottom Protect High Build Epoxy Primer, then apply 2 coats of antifoulant. On Bare Steel: Sandblast surface to a near white metal; remove blast residue with a broom and airhose. Wipe off with Dewaxer-973. Do not sand. Fill in any imperfections with fairing compound. Sand smooth and wipe clean. 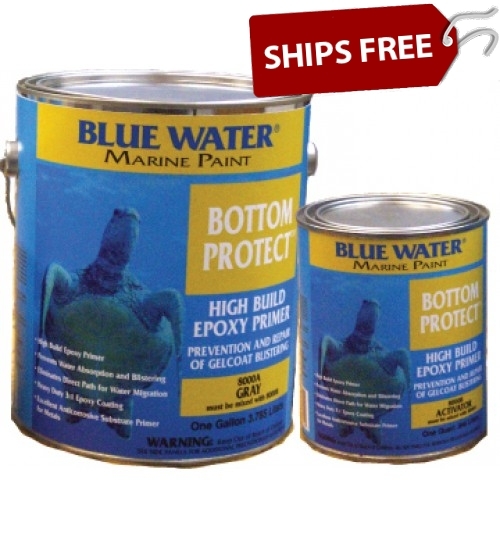 Apply 3-5 coats of 8000A/8000B Bottom Protect High Build Epoxy Primer, then apply 2 coats of antifoulant. 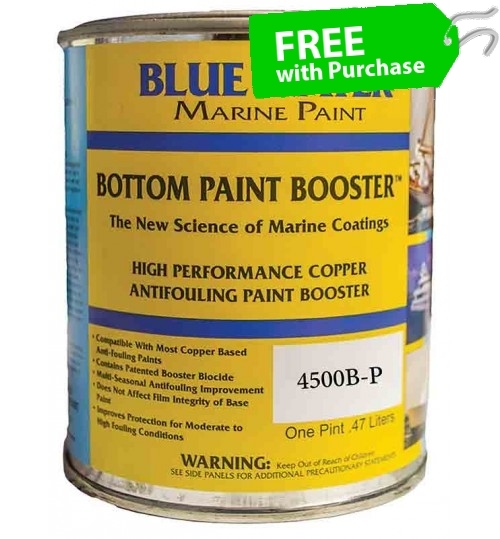 Copper Shield™ Uno provides single season antifouling protection against barnacles, algae and hydroids in salt and fresh water on boat bottoms only. Its ablative copolymer base renders a smooth finish with durability and abrasion resistance. 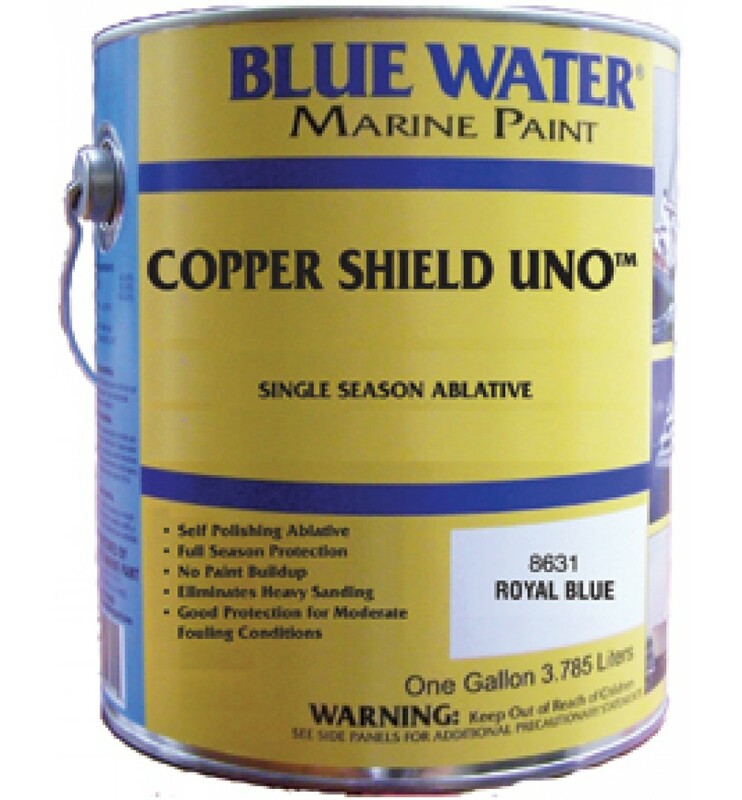 Copper Shield™ Uno releases biocide by the constant exposure of new paint film to the water. 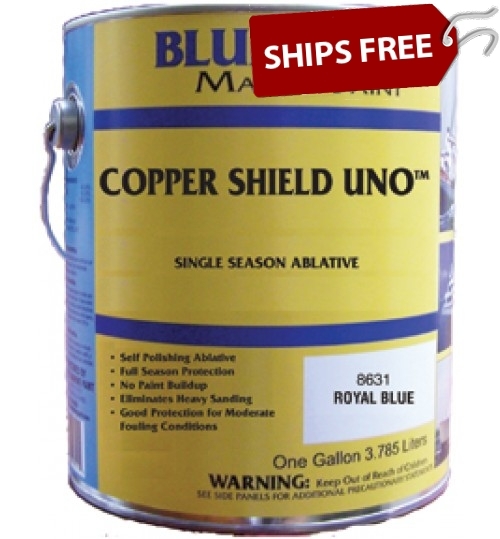 Copper Shield™ Uno has universal application over all types of properly prepared bottom paints (except aluminum). 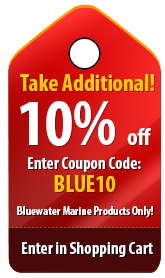 For use on fast fiberglass boats, as well as wood and steel hulls.